The witness shot several photos of the black discs, including this image that was blown up to show the objects better. 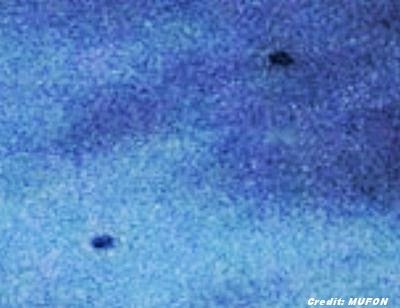 Two West Greenwich, RI, witnesses reported watching and photographing "two hovering black disc" UFOs about 5:33 p.m. on January 31, 2014, according to testimony in Case 53853 from the Mutual UFO Network (MUFON) witness reporting database. The two were driving along a local highway when the objects were spotted while looking out their passenger side window. "I told my boyfriend to look and he grabbed a series of pictures showing the objects standing still in the sky (hovering)," the reporting witness stated. "They were circular and had no lights." The couple got off at the next exit and drove toward where they saw the objects. "We had lost them in the trees after taking the exit and by the time we reached the area they were previously above, they were gone. We also saw a helicopter heading in the same direction as we drove closer." . . .